Doctor Cites Risks of High Calcium–Low Magnesium Consumption. Los Angeles, CA, March 9, 2012 — About 43 percent of the US population (including almost 70 percent of older women) use dietary supplements containing calcium;1 but Carolyn Dean, MD, ND, warns that, without balancing their calcium with magnesium, they may be at risk. • Typically, less than half of calcium intake is absorbed in the gut,2 the rest either being excreted or potentially forming kidney stones or being transported to soft tissues where it can harden (calcify). • Adequate levels of magnesium are essential for the absorption and metabolism of calcium and vitamin D.
• Recommendations for calcium intake vary greatly. In the US, adults are told to take 1,000 mg per day and women over 50 are told to take up to 1,500 mg. In the United Kingdom, the RDA is 700 mg daily, while the World Health Organization recommends only 400–500 mg.
“Most people—and most MDs—don’t understand the importance of calcium-magnesium balance at a cellular level. The effectiveness and benefits of calcium with respect to bone health and the prevention of osteoporosis are enormously impaired in the absence of adequate levels of magnesium in the body,” Dr. Dean states. “The commonly agreed-upon ratio of 2:1 calcium to magnesium found in many supplements traces back to the French scientist Jean Durlach,”6 explains Dean, “who stipulated the 2:1 ratio as an outermost not-to-be-exceeded level when considering calcium intake from all sources (food, water and supplements). This has been largely misunderstood and is taken as a recommendation of a 2:1 calcium-to-magnesium imbalance. The nonprofit Nutritional Magnesium Association (NMA) is a trusted authority on the subject of magnesium deficiency and provides timely and useful information so as to improve the lives of all people affected by the widespread magnesium deficiency in our diets and the related health issues associated with this deficiency. Radio, TV, magazines and professional journals interview its members regularly. 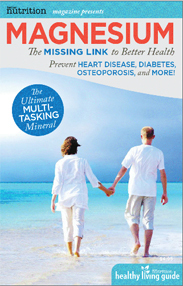 For more information, go to www.nutritionalmagnesium.org. 2. See reference 1 above. 3. Bolland, MJ, A Grey, A Avenell, GD Gamble, and IR Reid. 2011. “Calcium Supplements with or without Vitamin D and Risk of Cardiovascular Events: Reanalysis of the Women’s Health Initiative Limited Access Dataset and Meta-Analysis.” Epub BMJ (Apr 19): 342:d2040. doi:10.1136/bmj.d2040. PMID:21505219. 4. Raggi, P, TQ Callister, and LJ Shaw. 2004. “Progression of Coronary Artery Calcium and Risk of First Myocardial Infarction in Patients Receiving Cholesterol-Lowering Therapy.” Arterioscler Thromb Vasc Biol 24:1272–77. 5. Feskanich, D, WC Willett, and GA Colditz. 2003. “Calcium, Vitamin D, Milk Consumption, and Hip Fractures: a Prospective Study among Postmenopausal Women. Am J Clin Nutr (Feb) 77(2): 504–11. 6. Durlach, J. 1989. “Recommended Dietary Amounts of Magnesium: Mg RDA.” Magnes Res (Sep) 2(3): 195–203. http://www.ncbi.nlm.nih.gov/entrez/query.fcgi?cmd=Retrieve&db=PubMed&dopt=Citation&list _uids=2701269.